The Oklahoma City Thunder got awful news the other day, when they found out their star player, Kevin Durant would miss 6-8 weeks with a Jones Fracture. A Jones Fracture (read more about Jones Fracture) can be a tricky injury and it’s not a guarantee he will recover in that timetable. There is also a chance that Durant could be out longer than eight weeks, but hopefully he will recover fully in be back on the court in December. Can the Thunder win without Kevin Durant, who is set to miss anywhere from 20 to 25 games. It will be difficult, but you have to remember that Oklahoma City is also gifted with another top 10 player in the NBA in Russell Westbrook. Westbrook will have to step up and this is a chance for him to make a run at the MVP if he gets off to a hot start. Kevin Durant had to carry the team last season and did a good job and that eventually led him to the MVP. The Thunder also have one of the better big men in the game in Serge Ibaka. Ibaka is a block specialist, finishing second in the NBA last season in blocks per game. Ibaka will have to step up and score more than he is use to, he averaged 15.1 points per game last season. Oklahoma City has Kendrick Perkins at Center and he’s a dominant defender, but he is not a very good scorer. 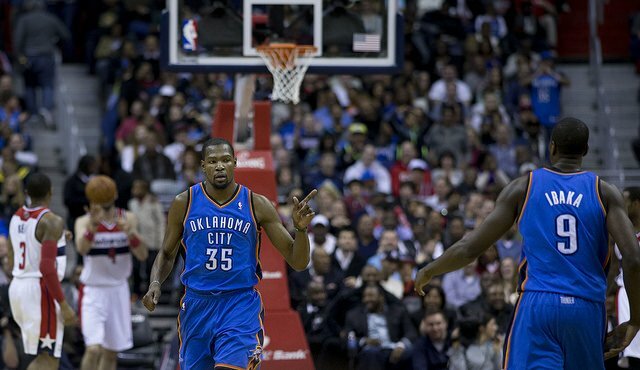 The big question for the Thunder right now is, who will start for Durant? Will it be his backup Lance Thomas or will the Thunder shake things ups and start Reggie Jackson? They could start Thomas, but he lacks experience and has only started 19 games in his three year career. In my opinion I would start Jackson at point, move Westbrook over to shooting guard, and move Andre Robinson to small forward. Robinson is 6’7 and has the height to play the position and Jackson played point last season when Westbrook was injured, and did a very good job. Jackson averaged 13.1 points per game and I think is the best option for the Thunder. Oklahoma City’s schedule favors them early on in the season. The Thunder are in the Western Confernence, last season it took the eighth seed Dallas Mavericks 49 wins to make the playoffs. Just to put that in comparison the third seed in the Eastern Conference had 48 wins. The reason all of that matters is because the Thunder can not afford a bad start, the Western Conference is just to strong to recover from a bad start. With the lineup I mentioned above, I feel like the Thunder can win 12 of the their first 20 games without Durant. If it takes Kevin Durant the full eight weeks to recover, you can look at him returning in the second week of December. The Thunder have a stretch in November where they play four of the worst team in the NBA. The Thunder are still a playoff team without Durant, and having to play without him might give some of the other players the confidence they need moving forward this season. It’s always awful to lose a teammate for a quarter of the season, especially one as important as Durant. You never want to see a guy get injured, but I do think that this could be a positive for the Thunder, having to work together through adversity. I expect the Thunder to to finish in the top three of the Western Conference this season, as long as Durant returns in December. If he does miss more games than I think the Thunder will finish around sixth in their conference.